KRUPINSKI Generalleutnant Walter, Knight's Cross with Oak Leaves and Swords. Known by his friends as 'the Count', he was a swashbuckling fighter pilot who learned his trade as Steinhoff's wingman; in Russia, serving with JO 52, he had Hartmann as his wingman! 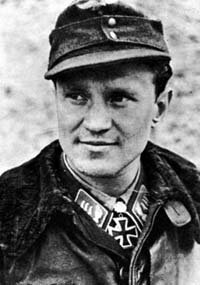 He fought also with JO 26, flying ME1O9s and the long-nose FW190D-12 and finally with JV 44, flying ME262s. In total he flew over 1100 rnissions and achieved 197 victories.